NASH COUNTY, NC – Shortly after 02:30 hours on April 24, 2016 Nash County Fire Departments from Whitakers (Station 10), Battleboro (Station 9), along with Enfield (Halifax County Station 3) were dispatched to 766 U.S. Highway 301 in Whitakers for a building fire. Engine 10 while responding noticed a large red glow in the sky and reported that they had a working fire. Upon their arrival, the Officer reported that he had a large one and a half story brick building measuring 80′ x 125′ that was heavily involved. He instructed all firefighters not to get close to the building due to possible collapse. Additional tankers from Heartsease (Edgecombe County Station 19) and Salem (Nash County Station 18) were requested. The Enfield aerial ladder was now arriving on location and was setting up the ladder truck on U.S. 301 when there was a huge building collapse on the A side and C side of the fire building sending the 125 ft long front and rear brick walls crashing down. Drop tanks were setup because there were no fire hydrants in the area. Tankers were forced to travel over a mile and a half for water supply. Engine 10 led off with a 2 inch water line plus a 5 inch supply line to Enfields Ladder truck. Due to the complete collapse of the building this was now a wet down exterior attack. There were no exposures. Firefighters spend over five hours shuttling back and forth to control most of the fire. The building was vacant at the time. It was was a former 10,000 square foot night club by the name of “The Triple Oaks” and it closed many years ago and was rented out then closed and has been vacant for quite awhile. There were no injuries reported from the fifty plus firefighters from the three counties fighting the blaze. 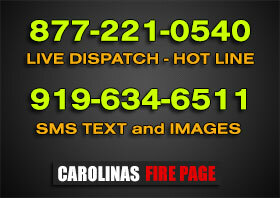 The fire is being investigated by the Edgecombe County Fire Marshal’s Office. Article and photos submitted by Bob Bartosz.